Snowpack Summary for Friday, March 29, 2019 12:23 PM Potential for wet avalanches. Fundraiser tomorrow! Overall: Natural and human triggered avalanches are unlikely near and above treeline during the early mornings. As the day heats up, natural and human triggered avalanches will be possible on southern aspects and any slope receiving strong solar input or consistent temperatures above freezing. Below treeline, wet avalanches may be possible on steep (>30°) isolated slopes where the snowpack has become saturated by a combination of sunshine and above freezing overnight temperatures. No new precipitation since March 22nd. No significant slab avalanches or unstable snow reported since February. Loose wet avalanches were observed this week near and above treeline (see photo below). Below Treeline:Coverage is good to excellent on most slopes above 9500', with plenty of safer low angle (<30°) touring. 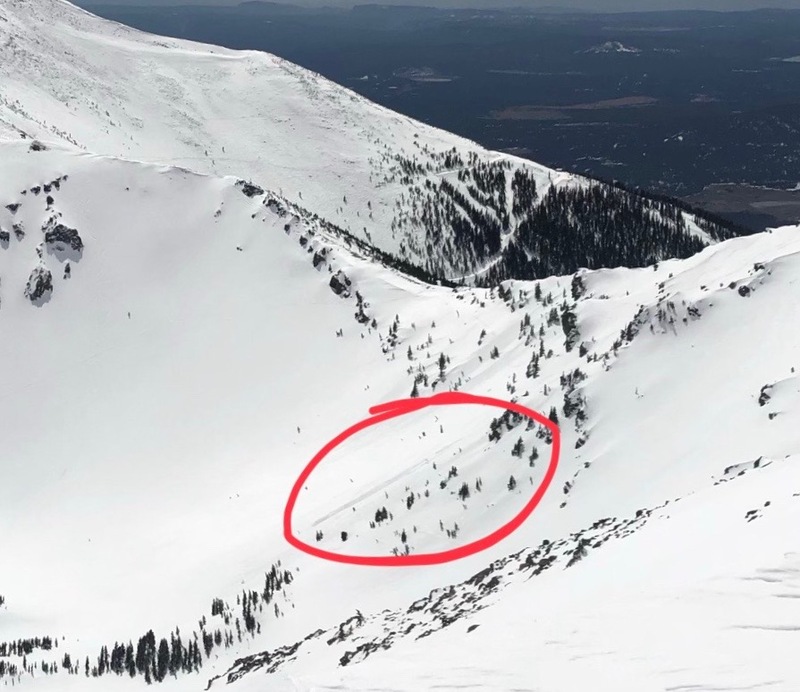 Wet avalanches may be possible on steeper isolated slopes where the snowpack has been saturated by a combination of sunshine and above freezing overnight temperatures. Watch for saturated, and deep slushy snow around terrain traps and any slope above 30 degrees. Evidence of loose wet avalanches were observed this week on east-southeast slopes near treeline. As the day heats up, watch for loose wet and larger wet slab avalanche potential - primarily above ~10,500' on steep easterly, southeasterly, southerly, southwesterly, and westerly slopes. Cornices have formed along ridgelines and cross loaded features. We saw evidence of natural cornice collapses last weekend. Stay away from overhung cornices, as these may collapse unexpectedly and break further back than you may expect. Small wet slides shown in Humphrey's cirque, within and above the red circle. These are east-southeast slopes, 11,700'. March 27th Photo by Tanner Porter. Last week was the first dry week in while, with no new snow. Spring conditions prevailed with average to above average temperatures, breezy afternoons and partly cloudy skies. Recent winds were generally out of the south and southwest, kicking up into the teens during the afternoons. Although threshold velocities for snow transport were met, limited snow was available to move, most of it compacted by previous winds or densified by recent melt/freeze cycles. Temperatures at Snowslide SNOTEL station have been continuously above freezing since 9:00 am on Sunday March 24, attesting to the rapid thaw below 9,700 feet. Spring conditions will continue throughout the upcoming week with little chance of significant precipitation. A low pressure system will pass near us on Wednesday or Thursday, bringing a bit of a cool-down and some wind, but little likelihood of measurable new snow. The weather on Saturday March 30 should be perfect for the Mikee Linville festivities. On Thursday, March 28, the Inner Basin SNOTEL site (Snowslide) reported a snow depth of 62” (157 cm) at 9,730 feet. Arizona Snowbowl reported a settled base of 96” (244 cm) at 10,800 feet. So far this winter, 327" (831 cm) of snow has fallen at the mid-mountain study site. Since March 23, SNOTEL temperatures have ranged between 14°F on March 23, and 51°F on March 25. At ASBTP (11,555'), temperatures reported over the last week were between 22°F on March 24, and 47°F on March 25.